Trinity Biotech is a NASDEQ quoted diagnostics company, specialising in the development, manufacture and marketing of clinical diagnostic products. The organisation is highly acquisitive frequently adding new companies and products to their vast portfolio. Their increase in product lines and business units meant they needed a new digital platform with increased capabilities to accomodate the growing areas within their business. 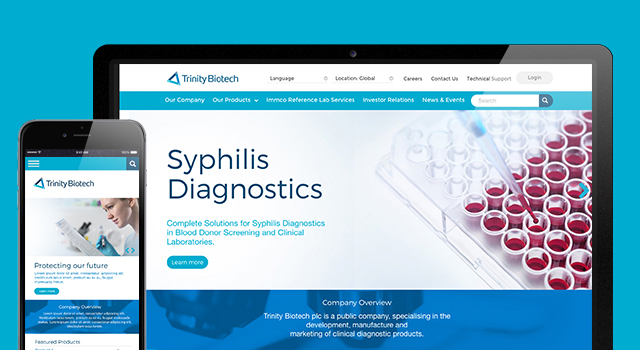 The new site needed to elevate Trinity Biotech’s leadership status within global diagnostics, maintain a prominent investor relations section, ensure ease of naviagation, and deliver expanded functionality for the integration of future brands and products. The launch of the new Trinity Biotech Website sees us developing another successful digital platform with our digital partners PointBlank.